Jerry DiPoto has been largely panned for this statement on why he traded Dan Haren for a package including Joe Saunders and prospects, particularly among those in the sabermetric community. Of course, we know that pitcher wins don’t tell the whole story; after all, how many times have we seen a pitcher have a win blown by his defense or the lineup, and how many times have we seen a pitcher bailed out by spectacular run support? However, with enough games, these things tend to even themselves out, and wins begin to track true talent. Looking just at starters with at least 690 innings pitched, winning percentage and ERA+ correlate strongly, with r^2 = .500. ERA+ is a simple statistic to use here, but I feel that it works given the sample, and the park adjustments come into play as well. Obviously, correlation doesn’t imply causation, but for the most part, pitchers that receive a win in most of the games that they start are better. This is a pretty simple conclusion to make, but it does, in part, justify the statements made by Jerry DiPoto. Joe Saunders has a 54-32 career record, good for a .628 winning percentage, good for 16th all time among pitchers with as many innings pitched – 692 – as Saunders. Some pitchers with similar winning percentages? Juan Marichal, Dwight Gooden, Roy Oswalt, Rich Harden, and Justin Verlander – a pretty solid group. If Saunders’s true talent was indeed akin to these pitchers, this trade would not be so widely panned. Saunders, however, simply isn’t that good. The correlation between winning percentage and ERA+ isn’t perfect, and Saunders is a great example of that. We see Saunders is well below the ERA+ that we would expect given how many of his games he has won. That’s because Saunders has spent his career playing for good teams, for the most part, and also with decent defenses. What about his counterpart in this trade, Dan Haren? Haren’s 120 ERA+ is well above what we’d expect from a player who has won 55% of his decisions, although it’s not terribly out of the ordinary – Erik Bedard, Cole Hamels, and Kevin Appier have similar careers. 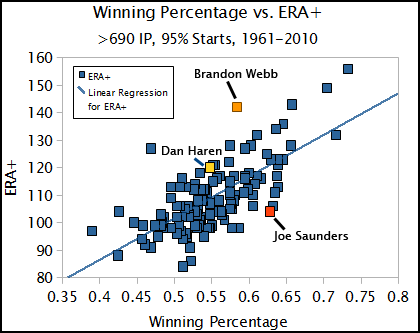 One of the largest differences between winning percentage and ERA+ comes from Haren’s former Diamondbacks teammate, Brandon Webb. Webb’s 142 ERA+ is nothing short of elite, ranking fourth among players with at least 690 IP and 95% of their appearances as starts, right between Roger Clemens and Randy Johnson. However, Webb has only won 58.4% of his decisions, well below the 65.8% mark from Clemens and the 64.6% from Johnson. Why? The Diamondbacks haven’t been as good as a team as the Angels or most of Clemens and Johnson’s teams. Outside of the 2007 playoff season, Arizona has had 3 seasons with win totals in the 70s, one in the 80s, and this year’s team is on pace to win 61 games. Simply put, in many situations, DiPoto would be right to go after the pitcher with the higher winning percentage. I’m not sure that he actually used winning percentage in his evaluation – that may just be a media talking point. Regardless, this is just another example of how we need context with all of these stats, and particularly with statistics like wins. With context, it’s clear that Saunders’ winning percentage doesn’t mean he’s an elite pitcher, and Dan Haren and Brandon Webb are good to great pitchers despite poor luck in the win column. We hoped you liked reading Joe Saunders’s Deceptive Winning Percentage by Jack Moore! Certain old-school GMs (e.g. Ken Williams, Brian Sabean, Ned Colletti, etc.) who are completely clueless with respect to how to construct an offense nevertheless seem to have had more success (whether through talent or luck) at putting together a good pitching staff. Do old-school pitching stats (e.g. win-loss records and ERA) do a better job of predicting pitching value than old-school batting stats (e.g. BA and RBI) do at predicting batting value? I’m pretty sure ERA is the best out of all the stats you mentioned. I also wouldn’t say Williams is clueless at offense construction. He values things like OBP and he really likes power given that U.S. Cellular Field is a small park. He has made some stupid moves, but for the most part, the White Sox have had pretty good offensive teams in his tenure. Certain new-school GMs (Billy Beane, Andrew Friedman, Jack Zduriencik, Omar Minaya) always seem to have great pitching staffs (whether through talent or luck). Are new-school stats better than old-school stats? Completely irrelevant to what he was asking, he wasn’t saying old-school stats are better than new-school stats. Omar is far from being a new-school GM. He’s about as old-school as it gets. Good team defense doesn’t hurt either. I would definitely say yes. I think win-loss CAN be some kind of indicator of talent, in that, if offensive production evens out over time, it can be an indicator of how often a guy pitches well, which is important for a guy who isn’t playing every day. If you’re someone like Jamie Moyer, who has two atrocious starts this year (total of 4 innings, 15 runs in those starts), it is possible for win-loss to be a decent indicator of how often you do well in games you start. Obviously even then there would be better indicators, but it isn’t the worst stat in the world. Unlike the hitting stats, which give you nothing beyond what their face value, which doesn’t tell us much. That’s certainly true. But it’s also true that there are so, so many better indicators of pitcher quality than wins and losses. Why drive the Chevelle when you can step up to the Cadillac, so to speak? Lou Gorman was a GM who excelled at evaluating pitching and was terrible with offense, and I always suspected this was part of the reason.